A building delicately adorned in downtown Saint John, New Brunswick is Barbours General Store where you can find a variety of items. While in downtown Saint John in New Brunswick, Canada be sure to go to Barbours General Store and browse through all the products they display. 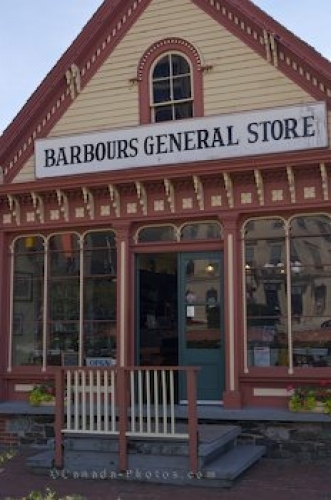 The large windows on the facade of the building makes this store very bright and welcoming and any supplies you may need can probably be found at Barbours General Store. Barbours General Store building in downtown Saint John, Bay of Fundy, Fundy Coastal Drive, Highway 1, New Brunswick, Canada. Picture of the unique exterior of Barbours General Store in Saint John, New Brunswick.